Amazing what pops up in our neck of the woods sometimes. 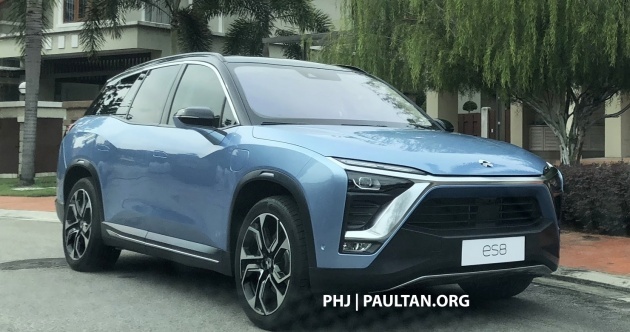 This is the NextEV Nio ES8, and it has been spotted in Malaysia. Quite a feat, considering that the offering from the Chinese electric vehicle start-up was unveiled in April and hasn’t even been officially launched yet – it’s only due to make its domestic market debut early next year. It looks like the SUV is in town for either an ad or product video shoot – reader PHJ spied a production crew filming the car and duly sent these shots in. The ES8 is a full-size offering measuring nearly five metres long, able to accomodate seven occupants in 2-3-2 seating configuration. Technical elements include an all-aluminium body and chassis, active air suspension and an electric all-wheel drive system, as well as a swappable battery. The SUV follows on the Nio EP9 all-electric, 1,000+ hp supercar, which had the honour of being the fastest road-legal car to lap the Nurburgring – its record time of six minutes 45.9 seconds set in March this year lasted for two months before it was bested by the McLaren P1 XP1 LM prototype. mali mali, jual RM 50K per unit…. i mau beli satu…..
What a beauty, how much? Wow RHD conversion, damm fast. Hail Middle Kingdom! Definitely down for a shoot, nothing more. Hope they open for sales here. New China cars have improved by leaps and bounds. Been to Shanghai auto show yearly. I see the fast pace of change. My ownership of Haval is nothing less than satisfying. Can’t say that for my new perodua though. Don’t think this start up will consider building Right Hand Drive version until it’s proven itself in domestic PRC market. IF they work with Geely, the possibility of arriving here faster may happen. But then again, isn’t Geely also working on their own EV?